A good Fair at Oxford and a ‘Barbarian’ at our gate! 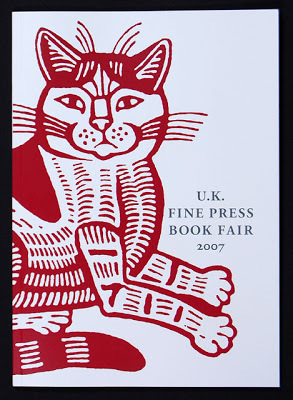 The Fine Press Fair at Oxford happens only every two years. When it finally comes around, after this long interval, WHOOSH and suddenly it is all over! We had a very successful time, though, talking both with many long-standing customers and with some folk who have only recently discovered the joys of collecting books printed by hand. There were so many people there, however, that we had little opportunity to see what other presses have been printing, which is usually one of the joys of being in a room all together. No time even to take photographs! So, two very hard-working days and then home again. Leading the Cranes Home was much admired – even by the judges for the prize of best book of 2006-7. The Abstract Garden and Black Marigolds also disappeared off the table at speed which is encouraging after all the hard work that went into their creation. 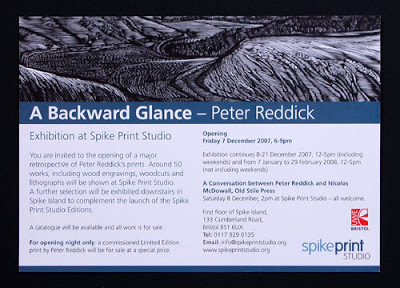 Peter Reddick, who did the magnificent engravings for The Abstract Garden, is about to open a retrospective of his work at Spike Island – the printmaking studio in Bristol which he founded with others. . . . It will be open, at 133 Cumberland Road, from 8th December until 21st December and then from 7th January until 29th February, 12-5 o’clock including weekends before Christmas but excluding weekends in the new year. 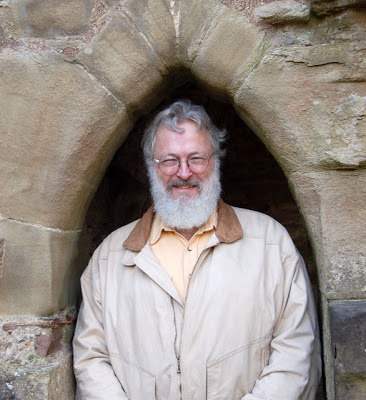 On our return home, we had the great pleasure of the company of Crispin Elsted who had come to the Oxford Fair from his Barbarian Press in Mission, British Columbia. After bewailing the fact that we had so little time for exchanges with other presses at the Fair, we were able to put our feet up and talk with Crispin who is poet, writer, ex-actor, designer and typesetter and has a wealth of knowledge and experience of life and literature. 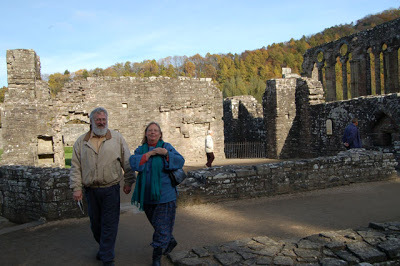 During the few days he spent with us we had to visit Tintern Abbey – especially since his wife Jan, who is the printer of all their exquisite books, has a particular love of the poetry of Wordsworth. Sadly she had been unable to come on this visit – so we paid her respects to our neighbouring monument. Here is Crispin with Frances instead! 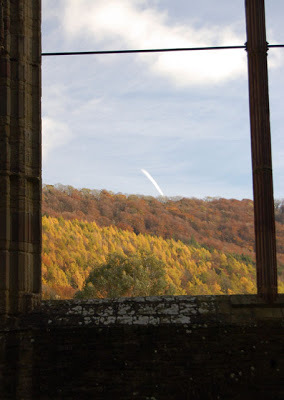 Many photos were taken so that she could share our ecstatic autumn day there, followed by a climb past Llanthony Abbey to Capel-y-fin to see the spectacular views which were part of Eric Gill and David Jones life for a number of years. While the inevitable Welsh rain came down on the following day, we listened to music, became excited over books for which we shared a love, drank wine, looked at pictures and cemented the friendship which until now had largely been conducted by e-mail across to the other side of the world. 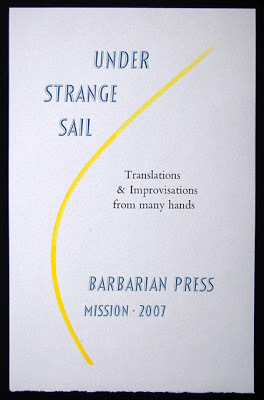 Here is a taste of Barbarian printing. Now, we have to move on to the next Fair – The London Artists Book Fair at the ICA, The Mall, London SW1. 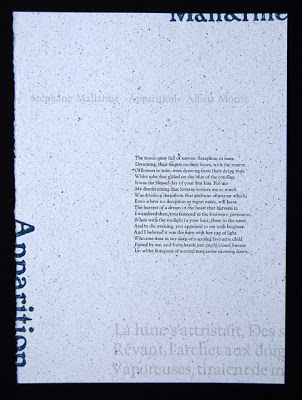 This fair has a very different collection of people who create books from those who show their work in Oxford but it is always stimulating and a wonderfully central place to exhibit. For those who did not manage to come to Oxford, we hope we may see you in London! Next year we hope to be at the Royal Academy again – more details later but that show is at the beginning of February. 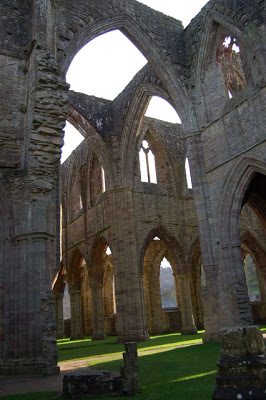 Then, for the first time, there is to be an Artists Book Fair in Glasgow at the Royal Concert Hall in April, which we shall be at.
. . . and, finally, three of my own sort of photos, the first taken in Tintern Abbey and the last two taken in the tiny church outside Llantony Abbey. 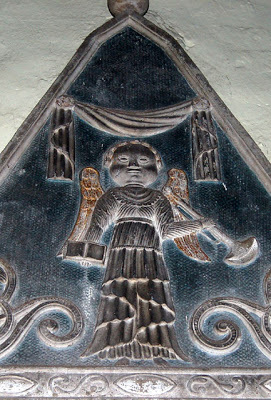 As the latter was so dark I could barely make out the shape of these monuments in the gloom. I aimed as best I could and the flash (which I hardly ever use) did the rest. What thrilling discoveries! 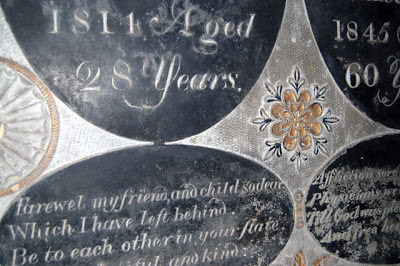 Nicolas and Frances, tried several times to email you but it bouned back. Can’t come to the ICA this weekend but wishing you an excellent fair.